Eau Palm Beach Resort & Spa is a classic South Florida beach hotel near the elegant High Society resort town of Palm Beach. Eau Palm Beach was a Ritz-Carlton until 2013.Now under private ownership, it has earned the highest official rankings in the hotel world. Whatever a guest wants in a luxury hotel, it's probably something that Eau Palm Beach has. Will Eau Palm Beach Be Your Florida Resort Style? Find Out! From the outside, it has a vintage look. It resembles an Old Florida mansion in Spanish-Mediterranean style. Inside, the resort is an appealing mix of classic, contemporary, and lovably quirky. Eau Palm Beach's 309 guest rooms were completely redone in 2015 by designer Jonathan Adler. Guest accommodations are available in numerous categories. The hotel's pet policy permits four-legged guests under 25 pounds. The prime accommodations at Eau Palm Beach are its 22 Club Level rooms. Club Level rooms give guests exclusive access to the gracious Club Lounge. • In this great-looking, welcoming space, you can relax, socialize, eat and drink, from early morning until after dinner. • A lot of guests walk in and think "this is so Mad Men"
What Do You Get in the Club Lounge? • That’s in addition to its free-flowing Champagne and wines. Eau Spa is an oasis of pampering and indulgence. Spa treatments can be either traditional or unique, but always high-quality treatments. Eau Spa's spacious, elegant locker rooms offer the requisite steam bath, sauna, and hot tubs.. But the spa's outdoor grounds are even more impressive. 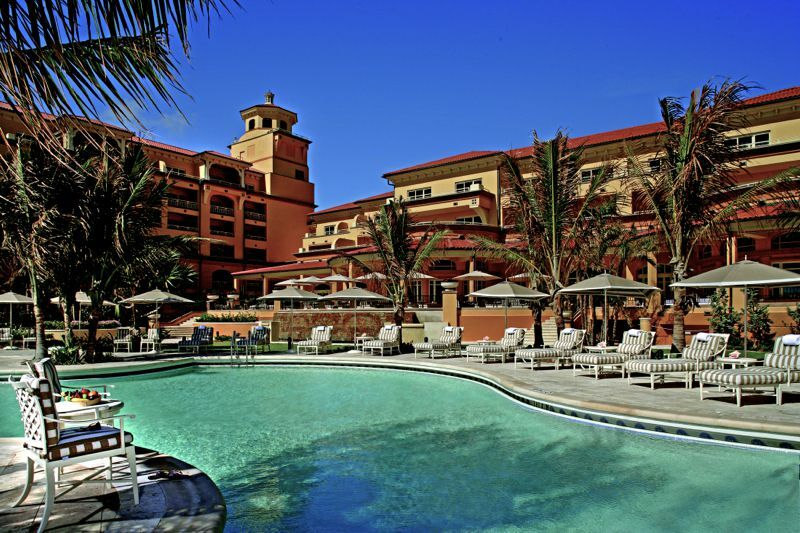 Eau Palm Beach is set directly on a clean, serene, simply stunning Atlantic beach. • Beach loungers are complimentary and cabanas are available for rent. The hotel has two pools. The hotel has a sleek, well-outfitted gym with an ocean view. Three Har-Tru tennis courts are on-property. • North Palm Beach Country Club (open to anyone, despite the name). Designed by Jack Nicklaus, who lives just down the road, the links are cfficially designated a "Jack Nicklaus Signature Course"
Parents like the fact that their kids have their own experience at Eau Palm Beach. Young guests ages 5 to 12 are invited to the AquaNuts kids' club. Coast Teens is a cool lounge and activity center that welcomes young guests 13 to 17. • Beauty Coast, the teen club's salon and modeling studio, has a runway and dance soundtrack, beauty supplies, gowns and jewelry; a photo shoot commemorates "the look"
The Palm Beach area is noted for its excellent restaurants, but many Eau Palm Beach guests see no reason to venture off-property for dining. Temple Orange is the hotel's principal restaurant, with a varied menu. Angle is Eau Palm Beach's the fine-dining restaurant. Stir Bar & Terrace is the resort's buzzy wraparound terrace. Breezes is open from lunch through dusk. Guests staying in the hotel's Club Level may find that the Club Lounge's well-made snacks and meals are all they need. In standard travel-industry practice, the Resorts Expert was provided with a complimentary media visit for the purpose of describing the hotel. For more info, see our site's Ethics Policy.